Hi, I'm looking to get a Super 8 camera from Ebay, no more than about $300 and hopefully less. I'd like one that can do 24 fps as well as 18. I used to do a lot of Super 8 filmmaking but I'd still like to ask questions about a few things. Since most or all of the sound models, that once took the larger Super 8 sound cartridge (now discontinued) do 24 fps, is it still fine to get one of these cameras even though all I will ever be doing is shooting (obviously) with the smaller silent cartridge? Thought I better check to make sure. Also, why are the Canon Super 8 cameras on Ebay generally the most expensive, say compared with Bell & Howell? Can anyone recommend a dependable, good model for the price range I'm looking for? I don't mind the brand. Would prefer internal automatic exposure. Good zoom lens would be nice - doesn't have to be powered zoom. 1. In general, sound-capable cameras mean "dead weight" as you won't be able to utilize their additional hardware for audio recording. 2. Canon has some excellent high-end models; for example, the 1014 XL-S. Nevertheless, I'd also consider an interchangeable-lens camera like those of Beaulieu. Their absolutely huge advantage is the ability to swap lenses. For example, if you absolutely must have (comparative) wide angle and/or low-light capabilities, you can screw in the 6-80/1.2 and if you don't, you can leave on the much smaller/lighter 8-64/1.9 etc. And those lenses are interchangeable with a lot of other cameras (for example, the Pathé Webo DS8 etc). I have 12 super 8 cameras of various brands; B&H, Bolex, Elmo, Yashica, Beaulieu and Canon. Only three of them have adjustable frame rate and sadly, only Beaulieu makes decent images. It's not just the glass, it's also the fact the Beaulieu doesn't have a beam splitter viewfinder, which means all of the light is hitting the film. The C mount of the Beaulieu also allows you to run super crisp glass, which helps the image become sharper which is nice. I also feel the registration of the Beaulieu is better than the other cameras as well. Of course the downside is buying a working Beaulieu 4008 is not cheap, especially with a decent lens. So I would just save some more money and buy the Beaulieu. What is the Schneider Optivaron 1.8/6-66 like? Is this a good lens? Are new batteries/chargers available for this camera? Thank you for the good advice. If you looking for an all around great camera with good optics the Elmo Super 110 may fit the bill. 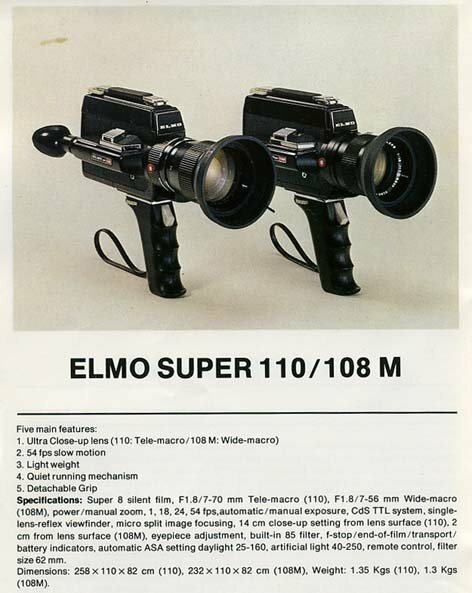 The "Super" series of Elmo cameras were built like tanks. Of all the cameras I've used the Elmo gives the sharpest images. Here's the Super8wiki link to read more about this camera. The auto exposure on these cameras works really well. Only needs 4 AA batteries to power the motor, zoom, and meter. I'd like to also add the Elmo Super 110 is one of the quietest cameras I've ever used! You can barely hear it run. Thanks! Food for thought. Do either the Beaulieu or Elmo Super 110 have any problems calibrating themselves with modern Super 8 film speeds, eg. for 50D, 200T, and the new Ektachrome? Can you just pop in the new films in these old 70s cameras and all is good with exposure (providing meter is still working fine)? The Elmo Super 110 has no problems metering modern film. I've shot both the new Ektachrome 100D and Kodak Tri-X black and white. In both cases the films came out perfect! I ran the camera in the auto setting and did not need to make any adjustments. However with both the films I mentioned here a Neutral Density X4 filter is recommended. It will allow the camera to meter to a much better F-Stop. Does this one look okay? Yes that camera appears to be in nice condition. The seller claims everything works. Of course you may want to reach out and ask questions. Thanks for your help Shane. In general, do you find that the early 70s Super 8 cameras need some type of re-sealing done on the edges around the film compartment door, like old SLRs sometimes do (eg. the foam/flocking type plastic strips that stop light getting in have disintegrated)? Or are these cameras generally fine to jump in and start filming with (assuming all is good otherwise)? As you'll see in the photo below the film is loaded into the back of the camera. There are no foam seals on this model. The film compartment door seals itself against the body of the camera. What does the Beaulieu typically go for? Are they difficult to repair? Also, please see my earlier questions if anyone is keen to answer regarding this model. Thanks!! "What does the Beaulieu typically go for?" I've recently (two weeks ago) purchased an 5800s in excellent condition, with the (for a zoom) stunning 6-80/1.2, for 320 euros + shipping. The camera has only one problem: it needs to be re-celled, but that can be done manually - there are a lot of tutorials on that. And it can operate on external power if you can put up with the power cable. Thank you for all the advice. Very helpful. Regarding Super 8, how many scanning businesses offer a digital stabilisation - is this common or a rare service, and is it expensive? 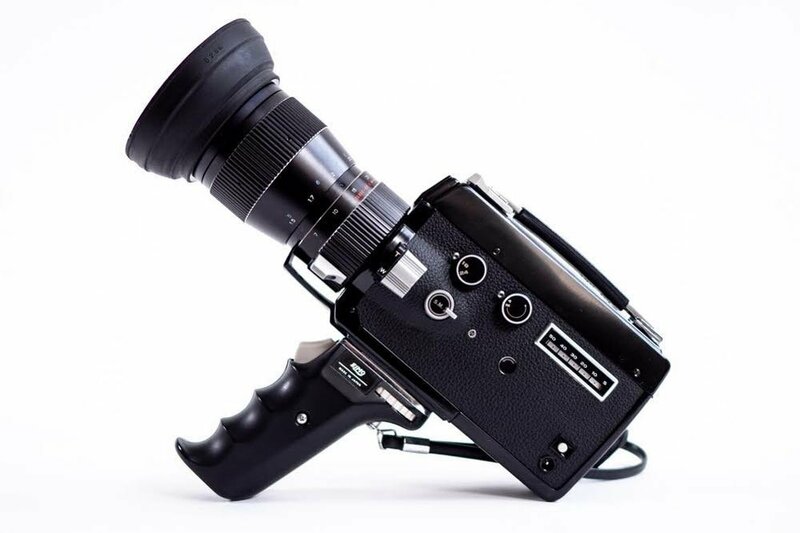 I've seen digitally-stabilised Super 8 online that looked like it was shot on a pin-registered camera. The sprocket hole was moving around though. With Super 8 I would like to intercut with 16mm and possibly digital, heavily-cropped to accentuate the grain and so on. Been done before many times of course. But I still don't really like the slight vertical jitter of Super 8 which would be accentuated in a big crop. I'd like to throw in one more option. The Nikon R10. It's been the most problem free of my cameras. It feels the most solid of any I've owned. I have a Leicina Special, Beaulieu 6008. They both have interchangeable lenses, but they've also been more finicky. The Beaulieu especially feels more delicate and plasticy. I've also owned the most quiet camera made, the Nizo 6080, but the more electronics a camera has, the more chance for something to break. The R10 is the go-to camera when I need a work horse, and by far the easiest to shoot with. Great, will definitely check it out Phillip. Nice looking camera. Do you find the tripod thread on the base of the handle makes tripod shots a bit shaky? I notice that the Elmo can remove the handle. The tripod hole at the bottom of the handle wouldn't be the most ideal place, but the camera is solid enough, and well balanced, that i don't think that makes much difference in the long run of you have a good fluid head. 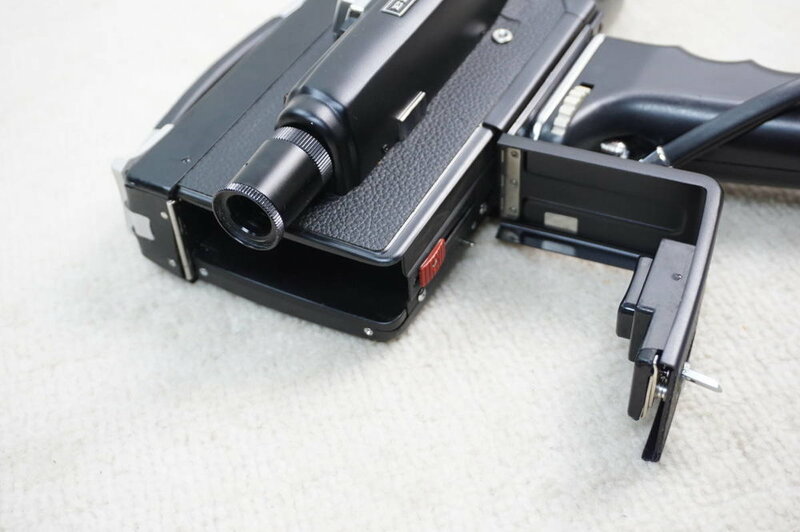 The general breathing of super 8 will out-weigh the potential issue with the tripod connection. Final Cut Pro X has stabilization, that I've been playing with, and it has done a surprisingly good job on breathing. Even on hand-held shots. At the end of the day, I never found a camera that did everything I needed. They'd be great at one thing, and lack in something else. The beaulieu 6008 had my favorite lens (Angenieux 6-90) but too finicky , and faster shutter often made footage look more strobe-like. Leicina Special is most compact with Schneider 10mm prime, but Leica M mount lenses aren't cheap, and the pull down claw has a tendency to not grab the perfs without a couple of tries(probably just mine) and i always forget to turn it off resulting in running out batteries. Nikon is the camera I can grab on the way out the door and know it'll work great, even though it may not be #1 in any above category, it'll be great in EVERY category. I haven't shot with high end Canons as much but those feel similar to me to the Nikon, but they're so much more expensive for whatever reason. I've always liked Nikons. Good company. The Elmo Super 110 can indeed be mounted to a tripod. The pistol grip unscrews from the bottom of the camera. I usually shoot handheld but often thought about using the Elmo with a tripod. I have to ask have you ever seen the Super 8 image projected on a screen? I only watch my movies this way as I feel the digital conversion looses a bit of the fun with Super 8. I mainly shoot home movies of family and friends. Everyone gathers around and watches the movies up on the screen. They all comment on how good Super 8 looks this way. It probably helps that I am using an Elmo projector with 150 watt bulb and a prime Bolex "HiFi" lens. If my budget could stretch a bit further to a projector yes I'd be in to reversal projection in a flash. At the moment I'm aiming for things that can pay themselves back hopefully, so I'm really into photochemical scanned to digital - which I love the look of too. I actually love the latest digital technology. I look at the latest phones, tablets and tvs and think, wow, imagine my film footage showing on that absolutely wonderful device. 4K cinematography on the latest tvs I see in department stores I find amazing but am absolutely uninterested in as a medium for my own filmmaking. Most of my filmmaking in my teens/early twenties was with full photochemical workflow, editing, the lot. So great to hear the sound of a projector. Maybe one day again! I definitely agree that digital media today is fantastic! The photos my Google Pixel phone are able to take is amazing! Like you I am in awe of the 4K TV's and how good the video looks. But I agree it's almost too perfect for home movies. It's what I like about Super 8 the fact it's not perfect. Plus with Super 8 you can get some crazy cool images and colors that you won't get on digital. We live in some interesting times where we can use both mediums depending on the look we are trying to achieve. Regarding Super 8, how many scanning businesses offer a digital stabilisation - is this common or a rare service, and is it expensive? I've done a lot of stabilisation myself in FCPX with Super8 footage I've scanned myself (with the cheap Wolverine scanner). It's pretty OK. Other video editor suites should work similarly well. Ruotsalainen, you transferred those films with a Wolverine? Yup, with the default (medium) sharpness.